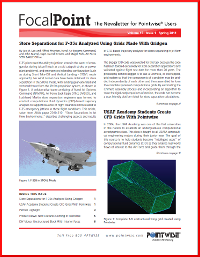 The Spring 2011 issue of Focal Point, our newsletter about CFD mesh generation, has been mailed and should be arriving in your mailbox very soon. Partner Highlight – VINAS Co., Ltd.
Want to contribute an article? Let us know at focalpoint@pointwise.com. This entry was posted in Applications, News, Software and tagged CFD, mesh generation, training. Bookmark the permalink.